At our board and train facility in Northern Virginia, we always get a lot of questions around Thanksgiving. You may not naturally consider your family pet to be a major part of Thanksgiving as a holiday, but your dog can be a source of stress or setbacks if you don’t know how to take care of them during a busy holiday time. After all, there are a lot of things going on around this time, whether you are traveling away for the holidays or planning to host the dinner. Taking care of your dog in these situations is important. First off is the most obvious aspect of this situation: is your dog coming with you or staying at home? Regardless of the answer to that question, it’s important to make sure that their vaccinations and ID tags are up to date. You should also pack their food in clearly labeled and measured bags, have the vet records on your person, and ensure that your dog has access to a few of its favorite toys whether they are staying home or coming with you. If your dog is coming with you, these are the specific things you should concern yourself with: make sure the arrangements you’ve made for your destination allows dogs, have a backup plan if they don’t, and make sure you pack bowls and a simple mat for your dog. Just in case, you should also learn the location of a few local vets in the place you’ll be flying to. If your dog will be staying home during the holidays, especially if you’ll be boarding them, you’ll want to keep these things in mind. You need to make your reservations early, and drop your dog off at the boarding house several hours before closing time so they can acclimate to the environment. There could also be a pretty long check-in time, so you’ll want to get it handled with plenty of time available. A launder mat for your dog to use will probably be a good idea too. If you’ll be using a pet sitter instead, check your references first, and try to go for an insured or bonded sitter. Make sure you book them early, and make sure they have contingency plans even as you do. If you’ll be hosting a Thanksgiving dinner instead, there are some things you should keep in mind for that situation as well. You’ll need to prepare your dog for guests, including other dogs that may be brought to the party. Clearly, you’ll need to brush up one your dog’s manners, including obeying commands. You may also want to keep your dog on a leash if you know they are rowdy, and ask some safety questions. Is your dog comfortable with everyone who is coming, including their dogs if they come too? Always be on the lookout for stress signs during the gathering, and have a plan in case that happens. Of course, you should let your guests know that your dog will be there in the first place. If you have guests that will be bringing a dog, let them know what rules you expect that dog to follow beforehand. Introduce the dogs outside of the home first, and keep in mind the potential for hostilities between two dogs, which are often triggered by infringement on food, toys, personal space and especially uneven affection. We all know that a big part of Thanksgiving is the food. But keep in mind that your dog wants it just as much as you do, if not more. You may need to consider your dog’s behavior during mealtime, and whether or not food should be shared with them. As far as behavior is concerned, it’s all about the commands your dog knows how to obey. Whether you have them sit at your side during dinner or to some other out of the way spot within the house, both are good options. At Off Leash K9 Training, this is what we use the “place” command for. You may also want to consider teaching your dog to refrain from immediately eating anything dropped from the table, though that’s a whole different lesson in willpower. As you will see on our YouTube channel, we do food refusal training. As for sharing food, remember that what is good for you is not necessarily good for your dog, even if your dog acts like it would be. Fatty foods, grapes, onions, sage, and many other Thanksgiving foods are very dangerous for your dog to consume, and of course, bones are an entirely bad idea. Even if you have a small dog and the bones seem big enough for them, don’t do it. Bones like that aren’t the same as the ones you might buy from Petco, and the dinner table bones are extremely vulnerable to cracking and splintering, which could lead to choking or other health hazards. If you are going to feed your dog, don’t let them see you procure the food itself: if they notice that it came from the table, they are likely to stick around or worse. If you want to feed them something healthy, stick to ice cubes and carrots at most, and when all is said and done, secure your trash cans so your dog doesn’t have a field day with your garbage. 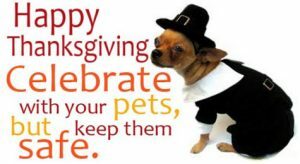 As long as you keep these things in mind, your family, including your dog, can have a wonderful Thanksgiving. If you want your dog to be well trained for all of your holiday guests, contact us at Off Leash K9 Training!